Terrazzo is a man made stone made using natural stone chip pieces which are then set into cement or epoxy medium. Epoxy terrazzo is much more durable than cement madium and it is the floor of choice of many supermarkets, hospitals, train stations and many other areas which experience high footfall of traffic. 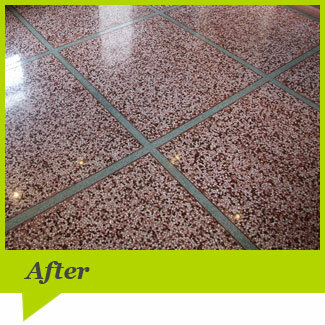 Even though it is durable terrazzo can still suffer chipping and holes. By using diamond grinding and polishing techniques it can be fully restored to its natural beauty. We can leave either a honed mat finish, Semi polished our fully polished. The choice is yours. 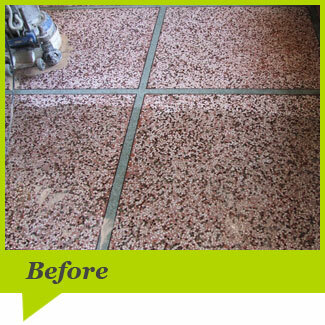 See below an example of a Terrazzo floor restored by Floor Cleaning Company.